Look, I hate Pez. I think it tastes worse than those cherry-flavored medicines they give you when you're a kid. But that doesn't mean I don't appreciate the art of the Pez dispenser. Here's the obit of Curtis Allina, one of the men who helped get the Pez-people out into the world. Note that the article specifically doesn't say he thought of it, but he made it happen. And our world is the richer for it. 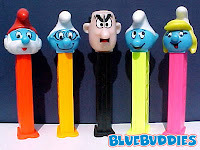 Check out the full-body Pez dispensers that started it all...scroll down on this page. What's the best Pez dispenser you ever bought? Or saw, and forever regretted not purchasing? Share in the comments. *Title quote from "Stand By Me," of course. Raaaar! I vote for Chewbacca. Although the candy probably tasted like wet dog.